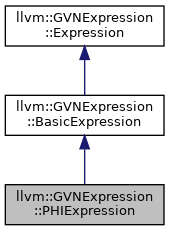 Definition at line 501 of file GVNExpression.h. Definition at line 506 of file GVNExpression.h. Definition at line 513 of file GVNExpression.h. Definition at line 517 of file GVNExpression.h. Definition at line 524 of file GVNExpression.h. Definition at line 529 of file GVNExpression.h.